Cambridge-Hitachi announces that new titles from their bestselling Penpals series will use new digital watermarking. Cambridge-Hitachi, a joint venture between Cambridge University Press and Hitachi Solutions, today announced that new titles from their best selling Penpals series will premier Hitachi Solutions’ new digital watermarking technology. Hitachi Solutions has developed a new technology which embeds a digital watermark within an image, allowing a reader to access additional content by scanning the image with a smartphone or tablet. A watermark can be embedded in photos, pictures, small icons and even printed textures, and, since the codes are design-friendly, they are suitable for a range of different publications. Penpals for Handwriting is the UK's leading handwriting scheme in schools. 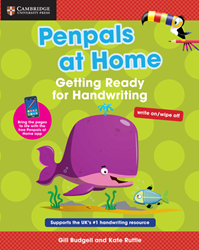 The Penpals at Home books are the latest additions to the series and have been designed to support the parents of 3-5 year-olds develop handwriting at home. The books will be available to purchase from 24th April 2014. Its extensive peer-reviewed publishing lists comprise 50,000 titles covering academic research, professional development, over 300 research journals, school-level education, English language teaching and bible publishing. Cambridge-Hitachi is a joint venture between Cambridge University Press and Hitachi. Since 2003 Cambridge-Hitachi has been developing curriculum-based resources that teachers value – not just because of their educational content, but also because the multimedia experience is highly engaging for children. Additionally, Cambridge-Hitachi helps businesses fulfill their corporate social responsibility (CSR) objectives in schools and colleges. For more information visit: http://www.cambridge-hitachi.co. Hitachi Solutions, Ltd., headquartered in Tokyo, Japan, is a core member of Information & Telecommunication Systems Company of Hitachi Group and a recognized leader in delivering proven business and IT strategies and solutions to companies across many industries. The flagship company in the Hitachi Group's information and communication system solutions business, Hitachi Solutions offers solutions for social innovation such as smart cities. For more information on Hitachi Solutions, please visit: http://www.hitachi-solutions.com/.